Autumn brings with it many delights, not least the lovely root vegetables on sale–unless you are lucky enough to grow your own, then even better. In this lovely and super-easy recipe, you will find a wealth of vegetables and all of them of your own choosing or what is available. In this recipe, you will find both orange and yellow carrots, celeriac and parsnips. Each brings their own flavors and textures to the dish and this is pretty much all you will need to consider when deciding on what to use, as most roots cook at about roughly the same time, which is a big help. 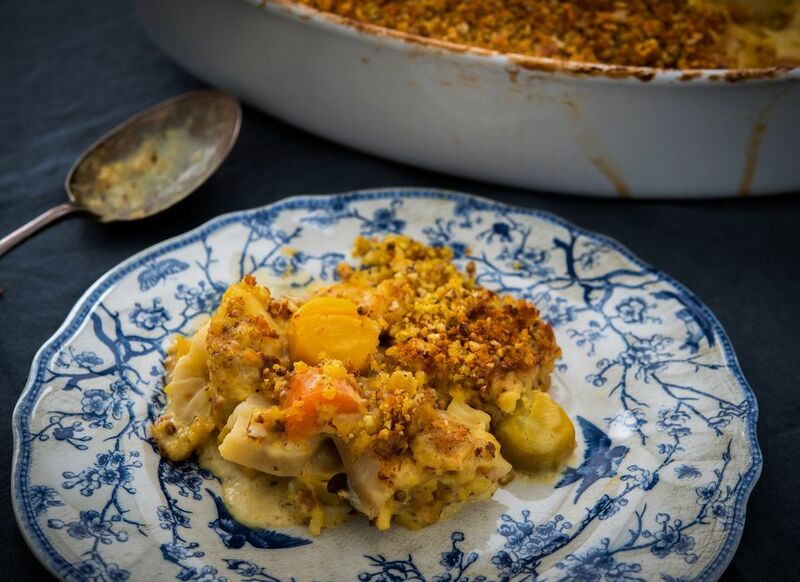 With the further addition of vegetable stock, cream, a little butter, a light spicing and finished with crunchy topping, this dish makes a fabulous side dish to roast meats or long-cooked stews, or a dish in its own right and especially suitable for vegetarians (but not Vegan). This dish does not freeze well but keeps in the fridge for a few days if covered. Melt the butter in a large saucepan, add the olive oil and the sliced onions, cover with a lid and cook for 8 minutes over a medium heat until the onions are soft. Check from time to time to make sure they are not burning. Add the garlic to the pan, lower the heat and cook for two minutes. Add the curry powder to the pan and stir. Then add the mustard seeds and stir again. Add the cream and the vegetable stock and bring to a gentle simmer. Add the root vegetables and bring back to a simmer. Cover with the lid and cook gently for around 5 to 6 minutes. Preheat the oven to 390F/200C. Grease a large ovenproof dish with a little butter, using a dish big enough to hold all the vegetables and liquids. Tip the contents of the pan into the dish and spread the vegetables evenly throughout the cream. Sprinkle with the sea salt. Cover with a sheet of foil. Bake in the center of the preheated oven for 40 minutes or until your vegetables are cooked but still just a little firm. While the vegetables are cooking, make the topping. Melt the butter in a small saucepan. Put all the other topping ingredients into a large bowl and stir thoroughly. Pour over the butter and stir again making sure all the ingredients are covered. Keep to one side. Once the vegetables are cooked, remove the foil and continue to cook for a further ten minutes to reduce the liquid slightly. Take the dish from the oven and using the back of a spoon, gently press the vegetables under the liquid. Evenly sprinkle the topping over the gratin. Return the dish to the oven and cook for a further twenty minutes until the topping is golden brown. Leave to stand for five minutes before serving.